The Coberger Academy uses the world-class training facilities at the Coronet Peak Performance Centre. Slopes are prepared to race conditions with the latest snowmaking technology and water injection systems. All training slopes are closed to the public and are exclusively for teams training. Coronet Peak Ski Patrol are on duty at all times of operation and provide first response to any medical situation should it arise. The CA provides single day training sessions through to season-long programs. Training commences when the mountain opens on the 9th June and runs through till the end of September. Each on-hill training session is a minimum of 3 1/2 hours starting at 7 and finishing at 11am. Technical free skiing, drill courses, free skiing exercises and gate training are all part of training sessions. 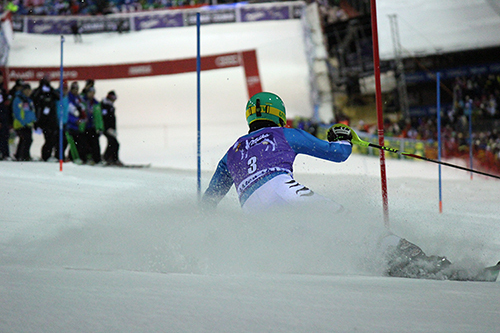 Slalom and Giant Slalom training is the main focus but Super-G training can also be arranged. Coronet Peak is the summer training base for the US Men’s and Women’s ski Teams. We train alongside some of the world’s best ski racers like Vonn, Ligety, Mancuso and Shiffrin. The latest training equipment, timing, video analysis and training methods are employed to maximize each session. Whether you are trying to make your National Ski Team, returning from injury or wanting to lower your FIS points the CA can help you reach your goals. Slalom, Giant Slalom and Super-G training is available on a variety of slopes. We have access to 3 training slopes at the Rocky Gully T-Bar area. The T-bar has a vertical rise of 180m with a ride time of 3 minutes. West of the T-bar are 3 training slopes. The training slopes are located east of the T-bar. These slopes are closed to the public from 7-11am while we are training. Race Arena is next to the T-bar and is a world class FIS homologated Slalom hill. RA has snowmaking on both sides and is prepared with water injection. It has two steep pitches and is constantly challenging the best skiers in the world. Robin’s Run is next to RA, it has one long steep pitch and a finish flat with two step downs along it. Snowmaking fans top to bottom provide an excellent surface. Out-Wide is our FIS homologated SL and GS race hill. Home of the 2013 and 15′ Winter Games Continental Cup ANC series, Coronet Cup and New Zealand National Champs. This is a popular training slope and is in race condition from the beginning of the winter.. Session price $175.00 includes training only, for Seasons lift pass holders. Bank deposit and international transfers through invoicing available, prior to training commencing. Program development fee is dependent on the type and length of the individual program.